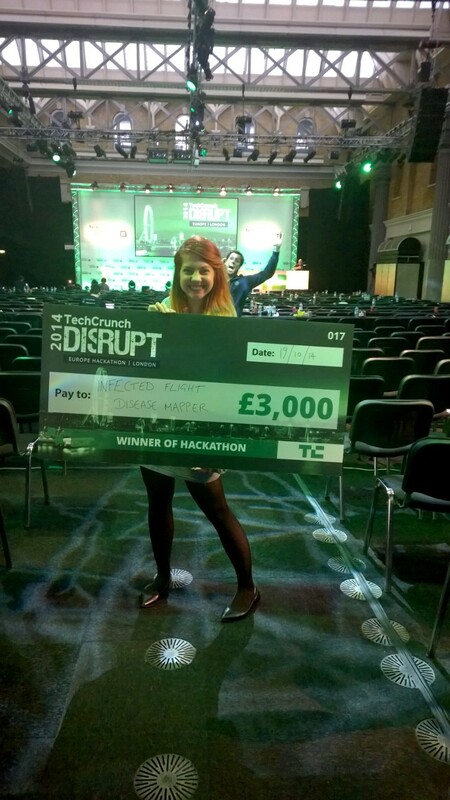 For those ignorants who do not know about TechCrunch Disrupt Europe, this event is probably one of the most anticipated tech events in Europe, and the hackathon undoubtedly one of the biggest in Europe. This year it was organized during the weekend of 18th — 19th October 2014 at Old Billingsgate, London. While participating in such high-caliber, cream of the crop hackathon, you are expected to compete against the most elite programmers coming from all around Europe, specifically gathered for this event, eagerly waiting to show the whole world how blatantly talented they are at coding like monkeys. Keeping that in mind, to even stand a chance, your best bet is to carefully select and handpick your supposedly rockstar team before or during the event and make them work together efficiently. Perfect. Exactly what I was looking for. Two young individuals in their prime, willing to sacrifice their mental sanity and health to serve as minions to conquer Old Billingsgate for 24 hours. But we still needed to recruit 2 other guinea pigs to serve our diabolic plans, as teams of 5 were required by the rules of this hackathon. As it was also organized on ChallengePost, a website specifically designed to ease the registration and the team-hunting process, I created a profile in order to browse through the list of participants and their respective skills/teams and in order to post a brief note asking for other teammates’ help. Again, when addressing to the code monkey top dogs, it is very important to stand out from the peasant crowd. These primadonnas are considered semi-gods in their respective fields, so you don’t want to display a cheap and weak impression of yourself, do you? Instead you want to distill godlike professionalism by using cleverly convoluted catchy sentences, highlighting the stunningly misunderstood geniusness underlying in your team, and sell it like it is the one-time chance for them to partner with you, considering how mind-boggingly talented you are with everything. Perfectly nailed it. Again. As you can see the description is pretty accurate, apart from the last sentence, obviously. It perfectly captures the hardworking, growth-aimed spirit of the team, creating a direct “wow” effect into everyone’s mind. Sky is the limit you would probably think while reading these lines. Now I can’t recall precisely how many team requests I received after this post, but I’m fairly sure this number was around 0, forcing me to revisit the whole strategy, as it was obviously too far-fetched and too well-engineered for such short-sighted puny minds. So we decided to attend the hackathon and find our last teammates there, while in the meantime we would try to work out some interesting ideas to hack through the event. D-Day. Here we go, Old Billingsgate. Right on time as usual, I took some time to breathe and contemplate the Thames by the riverside, as I saw no sign of nerdy faces that could possibly indicate the existence of a hackathon nearby. While I was patiently waiting for something to happen, my teammate Andriy called me, asking me where the hell I was, as he was making his way through the queue. Again, I was apparently mistaken, naively thinking that the entrance would have been set on the lovely riverside, while the opposite highway side has been preferred instead. This made perfect sense however, as bunkers are usually totally preferred over riverside views for optimal productivity during 24-hours coding frenzies. It leaves less room for potential distractions, as the last thing you want to feel during a hackathon is to feel relaxed, comfortably set on your sofa, its coziness relinquishing you from any pressure of any sort. Not happening. At least if you want to win. As we showed our tickets with excitement, we were escorted to what could undoubtedly be considered as the coder’s heaven: a basement. 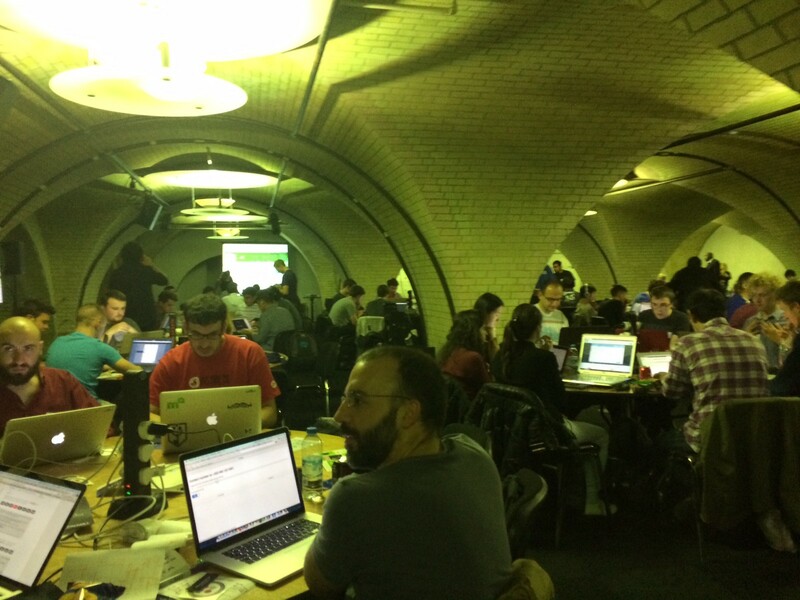 Not the average Joe’s basement, but a basement able to fit 800 angry developers ready to fill the whole place with broken keystrokes and dismantled mouses for the sole purpose of winning a feverish ogre battle where only the all-mightiest of the clickity code writers shall be proclaimed as the victor. A mood flawlessly transcribed by the speaker’s last words: “Have fun and enjoy!”. As we walked through the basement, we immediately rushed to occupy one of the few tables left, not without considering its strategic location, right in front of the sandwiches and refreshments stand. Just the time to install our groundbreaking state-of-the-art techy stuff and we parted ways to find our remaining teammates. As usual, Florent came back with a nice girl, Eleanor, who also won a hackathon recently. In the meantime, Andriy and I approached a “once young and beautiful student”, as he likes to call himself, currently PhD candidate at King’s College, which might explain his nostalgia of his glorious past years. So we had our dream team sitting around the table, getting to know each other, in the middle of all the surrounding noise and all the chaotic buzzing made by the geeky jet-set. 3 votes for Infected Flight sealed the deal. The idea was carried by Sarvar, our now magnificently rejuvenated student, who was doing most of his research on mathematical models based on differential equations. The plan was to simulate the spread of Ebola using this model by aggregating all the flight routes and computing a probability of infection. The results would then be mapped using ESRI’s ARCGIS geo-mapping API and animated and polished with D3.js and CSS3 transitions. 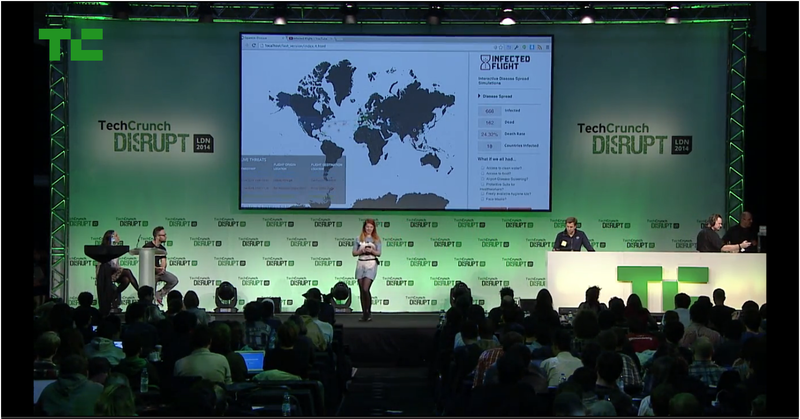 The main trick to be noticed here is that ESRI was one of the sponsors of the TechCrunch Disrupt Hackathon. Because we planned to implement their technology into our web app, we would automatically qualify for the $2,500 secondary prize that ESRI would generously award to the best implementation of their software. Why do you think we tech glitteratis would be so enthusiastic about locking ourselves for a whole weekend in a basement, surrounded by a delightful mix of sweaty emanations coming from palm-moist nerds exuding perspiration exponentially to each line of code written, coupled with a not less delicate panel of inadvertently dropped-on-shirt pizza slices and taurine-based energetic drink scents filling the room, if not for the big bills, eh? So our natural-born leader Florent proposed to handle the management and proper task distribution to the team members, which we felt pretty comfortable with, considering he was probably the most experienced of us all. We spent around one hour and a half to actually decide on the idea and efficiently distribute tasks, so now was the time to really get our hands dirty and code for countless hours, until death delivers us from our tragic fate. As this post is already way too boring and uninteresting, I’ll skip the embarrassing part where we spent close to 2 unsuccessful hours trying to center the map accurately with the help of a ESRI technician. I’ll also skip the part in which I was so desperate about being able to finish the map integration with clean effects in due time that I wanted to quit the project and crawl back to my lair to hibernate the rest of this winter. So I’ll go directly to the part where we had to submit our final product via the online form, accompanied by our presentation materials, and where we got a decent-looking and more or less finished product. Done and dusted as the proverb would say. Now we just had to prepare our 1-minute elevator presentation, with the demo running in the background. With such a short timeframe, there was room for only one person pitching and one person running the demo and the slides, and TechCrunch would only allow 2 people max on the backstage anyway. The stage really felt impressive, with nice spotlight work, cameras all around, 5-laptop setup ready to welcome the presentations of a hundred teams. As we were number 32 on the list to pitch, we had quite some time to practice a bit, hear the other presentations and learn from their mistakes. Florent was the chosen one to pave Eleanor’s road to glory. As he was the one who recruited her in the first place, it sounded like a perfect match. The presentation countdown was so slowly, imperceptibly churning out the numbers that we began to chafe under impatience and anxiety, as our two heroes had left our seating area a while ago to prepare their setup and make final adjustments in the backstage. As our heart failure’s probability just reached its paroxysm, the number 32 finally came, and with it our two representatives, and our demo already running on the background screen. After some more patience we would eventually have been told that the final results were ready to be announced. So after the traditional congratulations and thanks speech the organizers finally began the announcements by the secondary prizes, which were the main ones we were aiming at, as we felt confident to have decent chances to grab the $2,500 ESRI secondary prize. The announcement began with the other sponsors: Evernote, Maxtor, etc… to finally reach the long time awaited ESRI. The suspense was at its peak, when they finally said the magic words: “and a special mention goes to InfectedFlight, while the winners are: Crowdless”. Not so magic in the aftermath. The list of secondary prize winners continued while we were cheering ourselves up, comforting each other with the usual: “still, well done guys” or “will be next time”. Special mention wasn’t too bad anyway, and we could be proud of what we accomplished together in 24 hours. which echoed almost instantly with our joyful shouts, Eleanor’s “Oh my God!”, “Oh my God”s and the massive rounds of applause given by the audience. We hurried to climb up the massive podium and shake hands with the jury to claim our gigantic cheque prize under the general hysteria. It was quite an awesome feeling to experience, to claim the 1st prize over a field of 800 talented people and hold this cheque over the cheering crowd. Soon the people scattered a bit and we were invited for a filmed interview with the TechCrunch staff in the backstage. The interview was quite casual and relaxed and went pretty well. The TechCrunch staff also rewarded us with badges that gave us access to the main event, taking place the next day and warned that we would have to pitch InfectedFlight during 1 minute again at the Battlefield on the main stage! Front-End Developer @Stylizit. Firefox & Chromium contributor. Sportaholic, Swimmer & Chess Lover. Traveller.